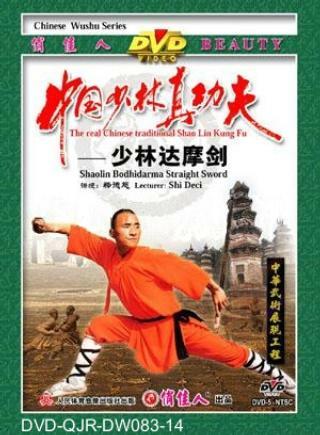 This sword play was created and passed on by Bodhidharma , the first India monk who came to the Shaolin Temple (Where he established and preached Zen Buddhism ). Zen means meditation. This sword is performed as if sitting in meditation. Attacks are hidden and produced in stillness. You should take every opportunity to attack suddenly. In real combat, you should repeat the use of chop or thrust, keep still, drive your force to the tip of the sword, and focus your attention as if you were in meditation. Often used techniques are swing in figure-eight pattern, thrust, cloud , and chop .